How To Get Rich Using Ancient Money Sutras ? How to use the Secret Law of Attraction ? 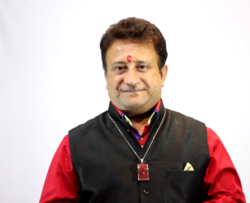 Suresh Padmanabhan – One of India’s leading authorities in wealth money and abundance tells Why Law of Attraction is Not Working for Most People and What are Ancient Money Sutras which Complete Law of Attraction Process. Suresh Padmanabhan is a professional speaker, author, coach and mentor. Suresh Padmanabhan changed the Lives of Millions with his Amazing Book “I Love Money” the International bestseller book which tells everything you need to know about Money. In Last 18years he taught about Money Energy to Thousands on his Workshop which has been running across the world. He is the Creator of Money Workshop- An Original International Workshop on Money and Wealth Creation running successfully since 15 years. Author of the international best seller – I Love Money now in 12 languages world- wide. He is also the founder of other amazing workshops like “Sankalpa Siddhi”, “Ancient Secrets of life”, and “Veda of Life”. He is also an author of other four books "Street Smart", "7 Secrets of Gratitude, "On Cloud 9" and "Ancient Secrets of Money. His talks have been telecast worldwide through Zee networks, a leading Indian based TV channel. All his workshops and books are in-depth and reflect the Eastern ways of teachings.